1001 reasons to visit 1000 Islands! https://www.thewineladies.com/wp-content/uploads/2017/08/WineLadiesLogoTransparent.png 0 0 Susanne Seelig-Mense https://www.thewineladies.com/wp-content/uploads/2017/08/WineLadiesLogoTransparent.png Susanne Seelig-Mense2011-04-27 12:00:012011-04-27 12:00:011001 reasons to visit 1000 Islands! Royal Wedding Cocktails to celebrate the wedding of the century! William and Kate, and the sapphire ring 1001 reasons to visit 1000 Islands! The Wine Ladies TV Wed April 27th, at 2:30pm-3:30pm on ThatChannel.com. Join us this week for The Wine Ladies TV as we explore the magic of the 1000 Islands. From the beaches, to the golf, the spectacular beauty of the area, the fascinating history and the wonderful culinary and wine available, no wonder there are 1001 reasons to visit the 1000 Islands! We explore this amazing region with the help of Kim Barr and Dayna Earl from Brockville & District Tourism who join us this week. Come celebrate the region with the 1000 Island Wine and Food Festival taking place (June 17th-18th) all weekend long at the Brockville Memorial Centre. Dine on delicious cuisine created by local award winning restaurants and local food purveyors. This week we welcome to The Wine Ladies TV from heavenly cheesecakes, to fresh roasted coffee, pancakes, artisan cheese ,olive oils and more. Taste local and international wine, spirits and beer and be entertained by some of the best jazz music in the country. The 11th annual 1000 Islands Jazz Festival, named the Canada’s “Best Small Jazz Festival in Canada” happens to be taking place at the same time, so while you enjoy the many fruits of the 1000 Islands you’ll be able to take in the tunes of popular jazz artists while sipping on your favourite vino of choice. Look for the giant jar of corks, count them here and you could win a surprise prize! For all The Wine Ladies TV podcasts and archived shows visit The Wine Ladies TV Show, ThatChannel.com and ThatRadio Podhoster from anywhere and anytime. Up-Coming events with The Wine Ladies NOT to be missed! June 2nd –The Wine Ladies to host an evening of South African Splendour Brought to you in conjunction with The Escoffier Society of Toronto in support of the World Chef’s Tour Against Hunger in South Africa and worldwide. To purchase your tickets online click here or call 905-338-6797 Join us June 2nd, 2011 for a special evening of South African culture , set in the stunning interior decor store Touch De L’Afrique for an evening of exclusive, spectacular wines from South Africa, scintillating food, mesmerizing music and much more. Experience a touch of Africa with the vibrant beat of the African drums, be spellbound by indigenous dance expression and be inspired by a “medicine man” reading with your personal encrypted stone. The funds raised that evening will help send our Canadian culinary team to South Africa this summer for the 3rd “World Chefs Tour Against Hunger:” Over 200 chefs from across the globe will to participate in feeding the nation. The World Tour hopes to raise a total of R4 million to fend off hunger. 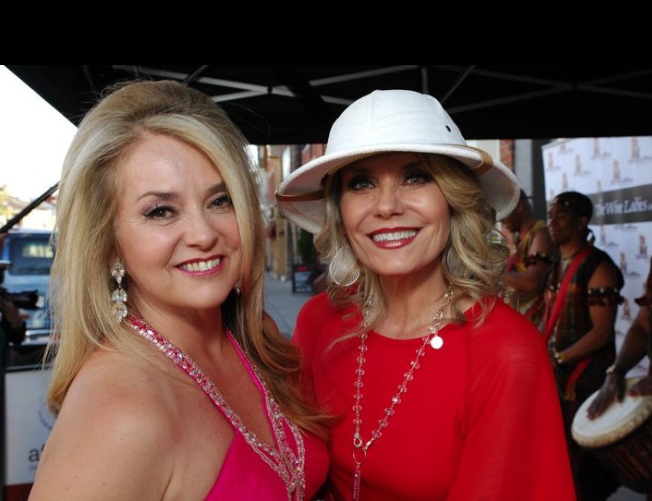 The Wine Ladies TV show “One Sip At A Time” will welcome you on the red carpet and capture the magic and special moments of this sparkling night. Our silent auction table will be abundant with an assortment of incredible prizes, featuring something for everyone including a special door prize to be announced. The South African wines will be available for purchase as well. Event Details Date: June 2nd 2011 Time: 6:30 pm – 10:00 pm Red carpet: 6:30 pm- 7:00pm: Event:7:00 pm-10:00pm: Place: Touch De L’Afrique, 229 Lakeshore Road East, Oakville, Ontario L6L 1H7 Cost: $75.00 (plus taxes) To purchase your tickets online click here or call 905-338-6797 Why are we doing this? As The Wine Ladies we are in an industry where we enjoy wonderful wine and fabulous food every day. In Canada, we are blessed from coast to coast with apple orchards, dairy farms, fisheries, wheat farming, to the wineries and much, much more. There are many people in the world that are not as fortunate as we are here, we want to help raise awareness for world hunger and help eradicate it forever! Please join us! This evening could not have been made possible without the help of our sponsors and partners. About The Wine Ladies The Wine Ladies, Georgia and Susanne founded by entrepreneur sister team in 2003, take life one sip at a time as they share the splendour of food and wine for all and the wonderful lifestyle it entails. Regular national TV personalities, columnists and hosts of their own weekly TV and radio show about wine, food and lifestyle these ladies share their passion and live life to the fullest and without hesitation. Their motto “everything in life somehow comes back to the vine” keeps their audiences entertained and informed. Contact them at info@thewineladies.com or Facebook FanPage. For all The Wine Ladies TV podcasts and archived shows visit The Wine Ladies TV Show, ThatChannel.com and ThatRadio Podhoster from anywhere and anytime. https://www.thewineladies.com/wp-content/uploads/2011/10/s7.addthis.com_static_btn_v2_lg-share-en.gif 16 125 Susanne Seelig-Mense https://www.thewineladies.com/wp-content/uploads/2017/08/WineLadiesLogoTransparent.png Susanne Seelig-Mense2011-04-25 20:33:002011-04-25 20:33:00Royal Wedding Cocktails to celebrate the wedding of the century! In anticipation of the nuptials of Prince William and Kate Middleton, we chat with royal mixologist Angus Winchester, having served royalty and created four special cocktails in honour of the wedding with 2 billion expected to watch and enjoy! Based on old British adage, Something old, something new, something borrowed and something blue, we sampled four delish drinks with one of the world’s oldest white spirit and favourite to royalty, GIN. https://www.thewineladies.com/wp-content/uploads/2017/08/WineLadiesLogoTransparent.png 0 0 Susanne Seelig-Mense https://www.thewineladies.com/wp-content/uploads/2017/08/WineLadiesLogoTransparent.png Susanne Seelig-Mense2011-04-25 12:00:012011-04-25 12:00:01Royal Wedding Cocktails to celebrate the wedding of the century! Royal Wedding cocktails for Canadians to toast the royal couple! Royal Wedding cocktails for Canadians to toast the royal couple! In anticipation of the nuptials of Prince William and Kate Middleton, we chat with royal mixologist Angus Winchester, having served royalty and created 4 special cocktails in honour of the wedding with 2 billon expected to enjoy! Doc Angus Winchester with his Doctor’s bag filled with an assortment of instruments! Shaker, shot glass, mixer and more! Angus Winchester, esteemed British mixologist who has shaken and served cocktails for the royal family says “the historical significance of royal wedding cocktails began in 1840, when Queen Victoria and Prince Albert featured a Claret Punch to commemorate their nuptials. This tradition continued throughout the years inspiring classic cocktails from the famed Savoy in London which included Wedding Bells, hand‐crafted for the groom’s grandparents in 1947 when Queen Elizabeth married Prince Phillip, and the Blushing Monarch created with much admiration for his beloved mother in 1981 when Princess Diana married Prince Charles.” Gin is one of the oldest white spirits and is commonly used in royal wedding cocktails. It’s also a self‐professed favourite of the Queen whose preferred tipple is a gin and wine aperitif, while her husband Prince Phillip enjoys a classic gin martini. This history has paved the way for gin to be a featured ingredient in Prince William and Kate’s royal cocktails, following in the footsteps of their ancestors before them. Angus Winchester, who has shaken and served cocktails for the Royal Family, shakes up a quartet of cocktails using Tanqueray Gin, drawing inspiration from the classic Victorian wedding adage ‘something, old, something new, something borrowed, and something blue! The Wine Ladies enjoy the cocktails and join in the fun! “The Blushing Bride”, “Something Blue” and “Something Borrowed” are the cocktails featured starting with The Wine Ladies, Georgia’s, Susanne’s and Angus’. Something Blue was created in honour of the sapphire ring worn by Princess Diana, this eye catching drink sparkles and pleases the palate! Recipes to enjoy as you watch the nuptials on TV Something Old This classic drink, documented in the famed Savoy cocktail book, embodies everything we love about Kate: it is fresh and lively with an understated elegance, and the grenadine twist makes it a true “blushing bride”. The Blushing Bride ¾ oz. Tanqueray Dry Gin ¾ oz. Triple Sec ½ oz Orange juice ½oz Lemon juice ½oz Grenadine Shake all very hard and strain into chilled cocktail glass. Garnish with Flamed Orange Zest. Something New An original cocktail hand‐crafted for Prince William and Kate, this drink is served in a long glass to represent the couples’ long life together, featuring the King of Fruit, the pineapple – so termed for its crown of leaves. The Newlyweds 1.5oz Tanqueray Dry Gin 1oz fresh lemon juice 1oz simple syrup 3 chunks fresh pineapple 1 small slice fresh ginger Soda Muddle fruit and add remaining ingredients, except the soda. Shake hard and strain into tall ice filled glass. Add fizz and garnish with pineapple leaf and pineapple wedge. https://www.thewineladies.com/wp-content/uploads/2011/10/s7.addthis.com_static_btn_v2_lg-share-en.gif 16 125 Susanne Seelig-Mense https://www.thewineladies.com/wp-content/uploads/2017/08/WineLadiesLogoTransparent.png Susanne Seelig-Mense2011-04-21 15:05:002011-04-21 15:05:00Royal Wedding cocktails for Canadians to toast the royal couple! 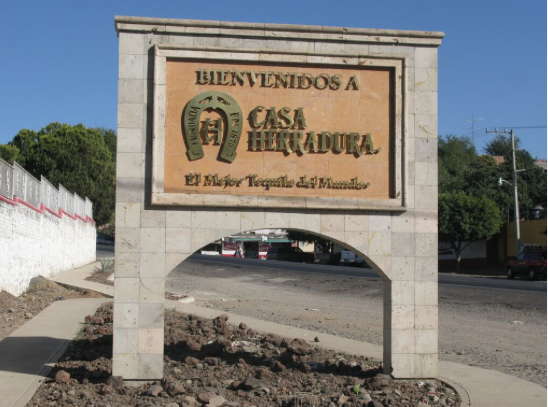 Casa Herradura, Mexico’s second oldest tequila distillery founded in 1870. Tequila, the fastest growing spirit and wine have a common ground. So we discovered on our recent visit to the city of Guadalajara. 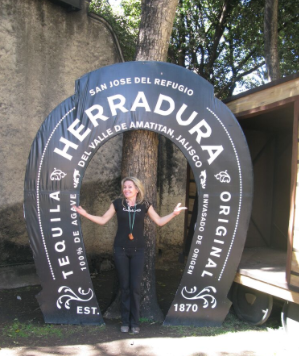 We toured Mexico’s second oldest tequila distillery founded in 1870, Casa Herradura. From the significance of terroir, to the “art” of harvesting, the relevance of natural yeast and the use of oak barrels, the parallels were great. Just as there is a ritual with wine appreciation including nosing, swirling and slurping, so too is there one with this often misunderstood spirit. We learned of other similarities including basic rules of food pairings. As well as the importance and impact of practicing organic methods and being 100% natural. Certainly a trend we are seeing today in our world of wine. We’d like to share a few of our discoveries starting off with the appellation system or regulations pertaining to “place”. Just as our wineries must follow the regulations of our VQA, so must tequila producers follow rules set out by their governing body the CRT or Tequila Regulatory Council. Origin of the grapes, specificity of, and minimal natural sugar levels of grapes at harvest are dictated by VQA as are the origin of the agave plant for tequila, predominantly produced in the state of Jalisco. 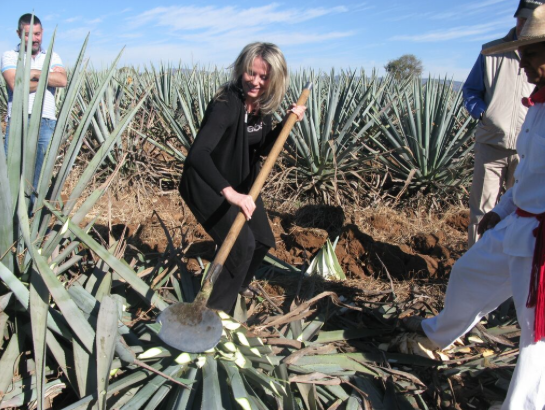 However permissible in five regions including areas in four other states the type of agave, it must be blue and the ripeness of the plant at harvest. As with wine, the relevance of terroir is key with a variety of soils and altitudes ranging from 6600 feet above sea level producing fruity, citrusy and floral notes while lowland, closer to the sea agave offering peppery spicy notes. Georgia harvesting Agave at Casa Herradura. With more and more vineyards moving toward organic and biodynamic farming we are seeing the results in better fruit and ultimately better wines. 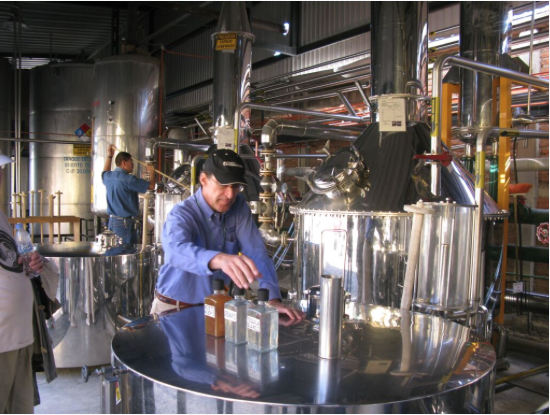 Casa Herradura also subscribes to this philosophy and practice, being the sole 100% natural distillery in Mexico. The proof was in the vat, sort of speak as we toured the facility, learning that the fermentation was spontaneous, wild yeast with no addition of specific yeast to kick-start or accelerate the process. The various open vats showed the agave juice at different levels of fermentation, with pure juice in the first, a partial transformation in the second, still sweet but with some alcohol, and the final, which we sampled, perfectly dry and still. The factory is meticulously maintained so as to allow for this natural process to take place in the vats. The process continues post fermentation, with Herradura distilling the remaining agave juice twice, cutting the heads and tails during both distillations to leave only the purest tequila for aging. Stocked exclusively with 200 litre American white oak barrels. The parallels between barrel use with wine and this complex spirit is once again very evident. Oak chips, larger oak barrels, as available in the wine industry are also utilized in the production of tequila, although not here at Casa Herradura. The small barrels, of varying levels of “toast” are selected to flavour and add complexity just as they are with respect to wine. The duration of oak aging is also a factor, transforming the potential and the flavour. The highlight of the tasting we enjoyed on the beautiful grounds of the Herradura Hacienda was tequila that had been aged for forty-nine months! It was the Seleccion Suprema, very dark copper in colour with an intense aroma of brown spice and floral notes, with a creamy and soft finish. It retails in the vicinity of $400.00 per bottle. But what the heck, we heard just recently that three bottles of Chateau Lafite Rothschild 1869 went for an unprecedented $232,692 per bottle. Breaking a new record for the world’s most expensive wine ever sold at an auction. The Tequila tasting at Casa Herradura. We could go on and on, as we so enjoyed our wonderful journey of discovery with this often-misunderstood spirit. We remarked over and over again, “just like with wine” and felt compelled to share. We’ve only just scratched the surface, as there are many other parallels, so please read on and enjoy. Riedel, The Wine Glass Company, the founder of the “functional” wine glass. This company has an extensive array of stemware to suit every wine and innumerable specific grape varieties. A glass for all wine lovers needs, has seen fit to introduce a glass specifically designed to showcase tequila. An elegant slender glass with a tall stem, meant to lift fine Tequila to the level it deserves, to allow it the appreciation and respect of which it is worthy. As with wine, nosing, swirling and encompassing the span of the palate is key. For maximum appreciation of tequila, place your nose in the middle of the glass, and smell. Taste and swirl the tequila to reach all corners of the palate. This allows each area to register the flavour and texture. After swallowing, allow a moment to register the finish. Just as there are basic rules for food and wine pairings, so there are for food and tequila. Starters and light food with Blanco, the more basic, crisp authentic tequila with subtle cooked agave taste. As with wine, no need to over power a simple, light appetizer with too assertive a flavour and mouthfeel.Main courses with Reposado, meaning “rested” in Spanish, aged for a minimum of 2 months. Could be fish, chicken, seafood or beef. Possibly an Anejo, aged minimum one year in barrels not to exceed 600 litres.Desserts definitely paired with Alejo. We would like to thank Ruben Aceves, International Director for Brand Development Brown Forman Tequila Herradura México. Reposado is currently available across Canada. HERRADURA REPOSADO TEQUILA LCBO 452615 | 750 mL bottle Price: $ 79.95 Spirits, Tequila 40.0% Alcohol/Vol. Made in: Mexico By: Tequila Herradura S.A. De C.V. Tasting Note Medium amber colour; very peppery nose, spice flavour, wood aged for a relatively mellow finish, interesting finish. Serving Suggestion Try neat or in favourite cocktail. Tequila and More Show! Win tickets to the Tequila and More Show here! https://www.thewineladies.com/wp-content/uploads/2011/04/Screen-Shot-2018-03-29-at-8.50.59-AM.png 407 548 Susanne Seelig-Mense https://www.thewineladies.com/wp-content/uploads/2017/08/WineLadiesLogoTransparent.png Susanne Seelig-Mense2011-04-21 12:00:012018-03-29 09:25:10Casa Herradura, Mexico's second oldest tequila distillery founded in 1870. Join us for the 1000 Island Wine and Food Festival taking place (June 17th-18th) all weekend long at the Brockville Memorial Center. Dine on delicious cuisine created by local award winning restaurants and local food purveyors from heavenly cheesecakes, to fresh roasted coffee, pancakes, artisan cheese ,olive oils and more. Taste local and international wine, spirits and beer and be entertained by some of the best jazz music in the country. The 11th annual 1000 Islands Jazz Festival, named the Canada’s “Best Small Jazz Festival in Canada” happens to be taking place at the same time, so while you enjoy the many fruits of the 1000 Islands you’ll be able to take in the tunes of popular jazz artists while sipping on your favourite vino of choice. Look for the giant jar of corks, count them at Brockville Tourism and you could win a surprise prize! The Wine Ladies to host an evening of South African Splendour! June 2nd -The Wine Ladies to host an evening of South African Splendour! Brought to you in conjunction with The Escoffier Society of Toronto in support of the World Chef’s Tour Against Hunger in South Africa and worldwide. 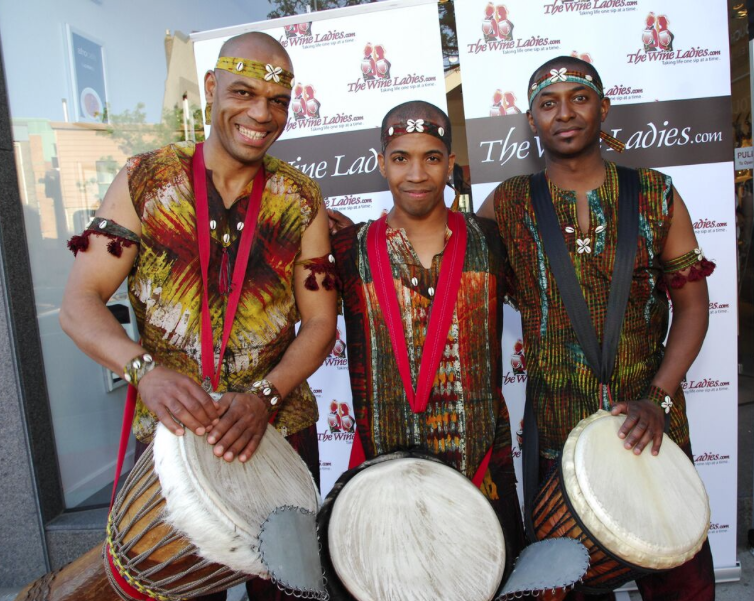 Join us June 2nd, 2011 for a special evening of South African culture , set in the stunning interior decor store Touch De L’Afrique for an evening of exclusive, spectacular wines from South Africa, scintillating food, mesmerizing music and much more. Experience a touch of Africa with the vibrant beat of the African drums, be spellbound by indigenous dance expression and be inspired by a “medicine man” reading with your personal encrypted stone. The funds raised that evening will help send our Canadian culinary team to South Africa this summer for the 3rd “World Chefs Tour Against Hunger”. Over 200 chefs from across the globe will to participate in feeding the nation. The World Tour hopes to raise a total of R4 million to fend off hunger. The Wine Ladies TV show “One Sip At A Time” will welcome you on the red carpet and capture the magic and special moments of this sparkling night. Our silent auction table will be abundant with an assortment of incredible prizes, featuring something for everyone including a special door prize to be announced. The South African wines will be available for purchase as well. As The Wine Ladies we are in an industry where we enjoy wonderful wine and fabulous food every day. In Canada, we are blessed from coast to coast with apple orchards, dairy farms, fisheries, wheat farming, to the wineries and much, much more. There are many people in the world that are not as fortunate as we are here, we want to help raise awareness for world hunger and help eradicate it forever! Please join us! Watch The Wine Ladies TV! Wed April 20th at 2:30PM -3:30PM on ThatChannel.com. Add a little sparkle to Easter with Girls Night Out wines Girls Night Out wines and chocolate. Join us as we explore the pairing of these two delectable treats. Two of life’s greatest pleasures come together in a blissful union! Perhaps not quite so mainstream as wine and cheese, but definitely as delish, or decadent if not more! Just in time for the Easter holiday! In studio to shed some light on this delectable duo, Doug Beatty Vice President Marketing of the highly successful Girls Night Out wines from Lake Erie North Shore, Ontario and Colio Estate Wines as well as Marketing Manager Alison Modesto who will reveal the woman’s point of view. Check out the Girls Night Out Face Book Fan Page too for great offers, contests and more. New Girls’ Night Out Sparkling! Just like you! Only $14.95 (with deposit) and available at any one of 14 Wine Region of Colio Estate Retail Boutiques or an LCBO store near you. Weather Wish! Just putting it out there, we are tired of the cold, the rain and the snow. The Masters was great but now it’s time for golf season to begin! Golf and wine go hand in hand, Can’t wait to take a few lessons with eight time LPGA champion Sandra Post at one of the undiscovered gems in golf The Diamond “in the Ruff Golf Club in Muskoka, beautiful w cottages to rent too. Also check out: Who you think is the better golfer Georgia or Susanne? A little sibling rivalry going on here. …..there are over 1,800 islands in the 1000 Islands Region, shared between the United States and Canada? …..that George Boldt the proprietor of the Waldorf-Astoria Hotel in New York City built a castle as a tribute to his wife, who perished at a young age before the castle was completed. Boldt, heartbroken, left the island and stopped the construction of the partly erected castle. It stands to this day unfinished. Join us for the 1000 Island Wine and Food Festival taking place (June 17th-18th) all weekend long at the Brockville Memorial Centre. Dine on delicious cuisine created by local award winning restaurants and local food purveyors from heavenly cheesecakes, to fresh roasted coffee, pancakes, artisan cheese ,olive oils and more. Taste local and international wine, spirits and beer and be entertained by some of the best jazz music in the country. The 11th annual 1000 Islands Jazz Festival, named the Canada’s “Best Small Jazz Festival in Canada” happens to be taking place at the same time, so while you enjoy the many fruits of the 1000 Islands you’ll be able to take in the tunes of popular jazz artists while sipping on your favourite vino of choice. Look for the giant jar of corks, count them at Brockville Tourism and you could win a surprise prize! CRUSH fashion wine event an outstanding success! Awesome Sunday afternoon was had by all at the 1st annual CRUSH event put on by our favourite ladies fashion store Silkeborg and Inniskillin Wines in support of the Red Roof Retreat. Incredible fashions featuring flirty little dresses, slinky pant suits, pastels, florals and more. Delish Chardonnay & Cabernet Franc from Inniskillin while munching on yummy munchies, & cupcakes! All for the great cause Red Roof Retreat, a charity based in NOTL helping kids/young adults with special needs. Thanks to SNO of Sweden jewellery for prize, thanks everyone for coming, we loved being your hosts today! Despite the chilly temperatures $2000 raised for Red Roof Retreat! Regular national TV personalities, columnists and hosts of their own weekly TV and radio show about wine, food and lifestyle these ladies share their passion and live life to the fullest and without hesitation. Their motto “everything in life somehow comes back to the vine” keeps their audiences entertained and informed. Contact them at info@thewineladies.com or Facebook Fanpage . For all The Wine Ladies TV podcasts and archived shows visit TheWineLadies TV Show, ThatChannel.com and ThatRadio.com from anywhere and anytime. https://www.thewineladies.com/wp-content/uploads/2016/07/images_SouthAfrica2.png 601 754 Susanne Seelig-Mense https://www.thewineladies.com/wp-content/uploads/2017/08/WineLadiesLogoTransparent.png Susanne Seelig-Mense2011-04-18 12:00:012018-04-04 09:08:24The Wine Ladies to host an evening of South African Splendour!